Yes sir. Please send a sample! Contact me. I need your info. Has anyone done an add-a-tooth with this material? Being that it needs mechanical retention to the tooth, I'm thinking it should have mechanical retention from the added part to the original part. Since this material is a polymer and monomer it uses polymerization and shouldn't need mechanical retention like the nylon type materials. 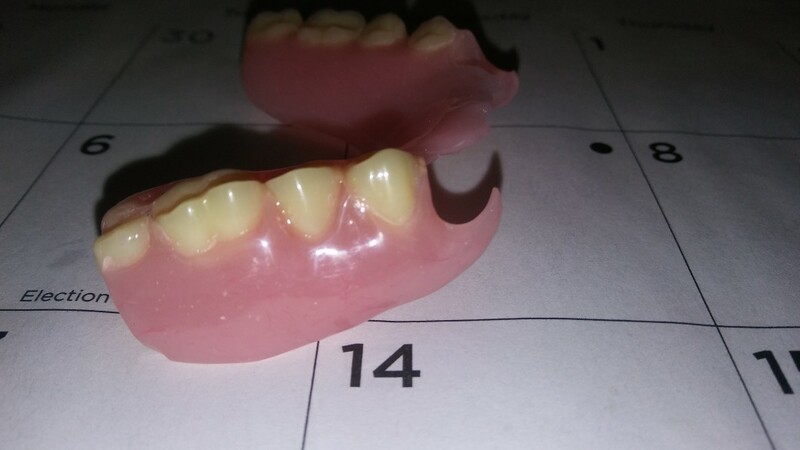 I experimented with this material before I made it available to my accounts and had no problems adding a tooth or repairs, but I still use a small bur that makes a donut shaped hole in the denture tooth just as a backup. I played with it a great deal before telling anyone too, but never broke one on purpose to see how it did on a repair. I found that diatorics were needed for my sanity, I managed to pop a few loose without them using what may have been excessive pressure. Anyway. here 'tis. Added tooth #12 and clasp to #11. Was previously clasped to #12. And, yes, I know my photography stinks. I am interested in selling semi flex material in Poland (EU).